The problem this project attempts to solve is to develop a workable moral education in light of the clash between religious forms of moral education and U.S. Supreme Court decisions concerning them. The concept of story and storytelling has been suggested as a unifying focus for disparate prescriptions for moral education. Several recent approaches to moral storytelling have been proposed. 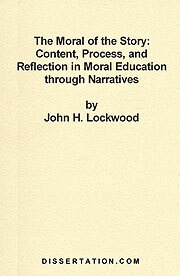 The approaches of William Bennett, Nel Noddings, and Herbert Kohl are among those which have attempted to combine moral education and storytelling within the last decade. Bennett is identified with other theorists whose primary concern is the moral content of a story. Noddings is identified as a process theorist, whose primary concern is the process of moral storytelling, not the content. Kohl is identified as a reflection theorist, whose approach challenges tradition in the hope of creating a more moral society. Each one of these three approaches attempts to provide a comprehensive program of moral education, but they fall short of that goal. The purpose of this project, then, is to construct a storytelling moral education program that improves upon earlier approaches. Using the three levels of moral thinking posited by R.M. Hare, a three-level approach to moral storytelling is proposed. The intuitive, critical, and meta-ethical levels of moral thinking that Hare refers to are used to frame a new, three-level, approach to moral storytelling. The three-level approach combines content, process, and reflection into a unified prescription for moral education. Thus, a more comprehensive plan for moral education through storytelling is developed, one that respects traditional forms of moral education while remaining within the parameters set by the U.S. Supreme Court.